Is content creation a challenge for your company? It is for one-third of B2B companies, according to the recently released B2B Content Marketing: 2018 Benchmarks, Budgets and Trends — North America. How do those problems develop? What bottlenecks do they create? And, more importantly, how can you address them? Let’s break down their insight to explore problems they’ve seen and the steps they took or advice they have to solve them. As an example, the review led to the conclusion that weekly meetings with the content and whole team were part of the over-processed system. Now the FedEx group has a monthly meeting where all are welcome. 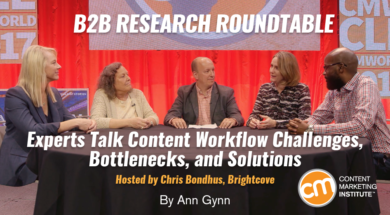 “As the content leads are drafting content, we share that … As we’re discussing as a team, we send an invitation to all channels: ‘Come listen to this conversation. Provide input. Provide suggestions,” he explains. And fewer meetings gave back time for the content team to spend on content creation. Zendesk found a sweet spot between not having any processes and having too many. It also has mutually agreed upon goals and mission around content. But, Monica says, the occasional bottleneck still arises. Often the challenge occurs around the goals for an individual piece of content or specific messaging. “If it is either not clear or not agreed upon in advance, sometimes you have to go back and redo things over and over because you didn’t lay that out in the beginning … or it wasn’t laid out for us clearly enough by the person we are creating the content for,” she says. To tackle this challenge, establish a step in your workflow to clearly identify the purpose and goals for an individual piece of content as identified by the original requester (if applicable), the content team leader, and the team member(s) creating the content. Content chaos is another hiccup that can disrupt a content marketing strategy and frustrate the content team. “It happens when the other departments or divisions across the business treat (the content team) like an order desk,” Ardath says. “You get bombarded with all of these requests, and it offsets everything else you’re doing. “There needs to be some way to stop that from happening … so there’s a way to cycle things through and get things done, and to prove the case for why you should develop it in the first place,” Ardath says. Drew relates well to the content chaos challenge. As FedEx introduced its new companywide process, 150 different requests were received. The content team eventually pivoted, asking “What story do we want to tell our customers? Based on that story, where does the request fit?” Then each request is addressed within the framework of the big picture. The paradigm shift has led the content team to close the gap between handling reactive requests and taking a proactive approach to content. “We’re much smarter,” Drew says. What message are you trying to communicate? Then, the content team leads the conversation about how to figure out how to tell that story in the most effective way, whether it’s an e-book, video, infographic, etc. The message, Monica says, is: “Don’t come to me and say, ‘I want a case study.’ Say, “Hey, here’s the message we’re trying to tell,” and then we’ll work together. Content creators also encounter challenges when they involve subject matter. But most often, the problems originate in the process, not from the subject experts. Ardath explains the challenge she encountered working with a client on an annual report that involved input from five or six subject-matter experts. “The problem was the project manager allowed them all to give input every edit round,” she says. “I get this thing back and it looked like it had been mangled by rabid wolves. Ardath resolved the problem by telling her client the subject experts had to be removed from the process if the annual report was ever to get done. Carla suggests content teams view subject-matter experts as resources. “Be a journalist. Learn what it is they know. There’s a lot of opportunities for stories … that may be missed because we didn’t take that time to dig in,” she says. Then figure out how their expertise fits into the bigger picture and create the relevant content. Drew says shared ownership can be a helpful way to think of subject experts and content experts. “It’s allowing people to understand where they fit into the puzzle,” he says. “These are the people responsible for creating the products and services,” he says. Ask them to own the value proposition and let the content team tell the story. By bringing those two together, you can create magic, he says. With no single solution to address your content creation workflow problems, you can take steps to mitigate them. Ensure that everybody is operating from the same playbook for both the big picture and the little ones, too. Develop a process that gives everyone a voice at the most appropriate points and respects each person’s role in that process. If you weren’t able to attend Content Marketing World 2017 or missed a few sessions, sit back and experience it today (and in the weeks to come). Sign up today for video access to hundreds of sessions, including the keynote presentations.